Chenwei Guo’s mom: “Thank you all so much. I have received much help from so many kind people that I had never met before and reached out to us. If possible and if the kind hearted people would like, I’d like to have a charitable fund that is named after Chenwei Guo to help more people that needed help.” She also said that “Please don’t worry about me and the family”. This GoFundMe for the family will go towards that charitable fund that she wants to create in the name of Chenwei Guo. On October 30th, 2017 a tragic incident took place on the University of Utah involving a carjacking that led to the death of my dearest friend, ChenWei Guo. Words cannot describe the pain, confusion, sorrow and grief that come as a result of this. ChenWei was most charactarized by his selfless service, faith filled lifestyle, and undefeatable positive attitude. 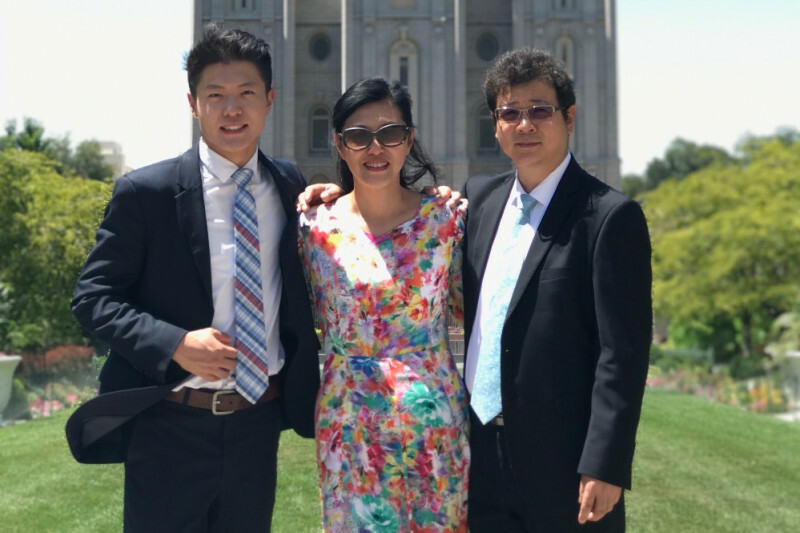 To honor ChenWei, an advocate of continually giving to others, the ChenWei Guo Family Fund has been created as a means to support his family's expenses as they go through the trying loss of their only son. The excess will be paid forward in support of spreading the same love that he felt to those around the world. This fund was created and managed by Chenwei Guo’s Family and close friends. It was created with the family’s permission. All funds from this go towards Chenwei Guo’s Family. We will update you everything until the money goes straight to his mother and his father. We have translated all your kind and encouraging to the family so they could feel your love. We helped organize this fund for Chenwei Guo's parents. Today we’d like to update you our progress with the kind help of Chenwei’s Utah lawyers and GoFundMe staff members. Also, Chenwei Guo's mother and father decided that they would like Chenwei's girlfriend, Madison Burns to withdraw the fund on behalf of the family and transfer the money to the family in China in February or latest in early March this year (2018). Madison has provided kind and loving help and support to Chenwei’s Family unceasingly. Chenwei’s mother emailed GoFundMe to officially authorize Madison to help withdraw and transfer the fund for them. We will explain to you in greater detail below. GoFundMe requires a person to have a U.S. social security number, U.S. bank account and other information that Chenwei's parents could not provide. Chenwei’s lawyers recommended that the best and least burdensome way would be to withdraw the money through an American friend’s personal bank account in U.S., to wire transfer into Chenwei's mother's bank account in China. GoFundMe staffs have contacted Chenwei Guo's parents in China, and confirmed the identity of Chenwei's parents by checking their government issued IDs. GoFundMe also had Chenwei's parents send their bank account information in China for wire transfer, and received their confirmation that Madison Burns would help them withdraw the fund and transfer the money to the family. Once GoFundMe help Madison withdraw the money, she will wire transfer the entire amount to the said bank account of Chenwei Guo's parents in February or latest early March. GoFundMe will facilitate and monitor the whole process, and receive the receipts and banking records. At that time, we will make one more update to you until the money that you have kindly donated reach to Chenwei’s parents. We are very grateful for the kind help and support from all of you, Chenwei's lawyers, the GoFundMe staffs, and Madison Burns. We will always remember Chenwei's example, faith, love and service. We are wrapping up this GoFundMe page since we have been working with Chenwei Guo family’s lawyer to set up a charitable foundation following the applicable state law. With the help of GoFundMe website staffs, we will transfer the fund that you have donated to a charitable fund managed by a professional trustee on behalf of Chenwei Guo’s family base on their wish. We are grateful for your kind words and generosity. We appreciate GoFundMe website staffs’ helpful instructions throughout the process. Special thanks to all the amazing volunteers! 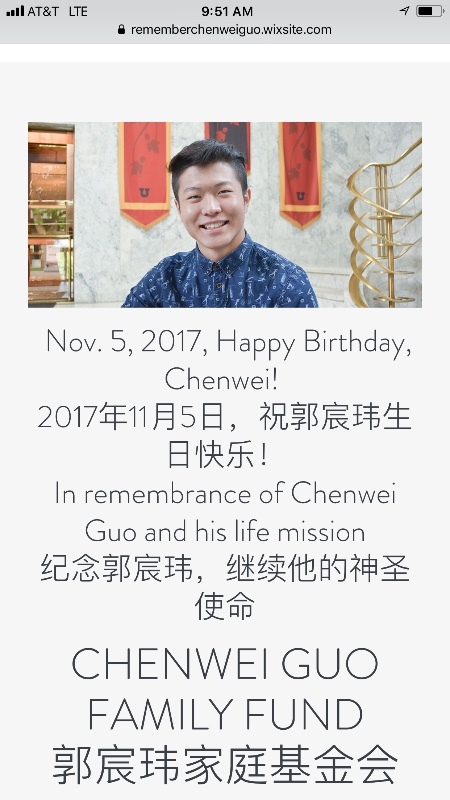 Please continue to share this GoFundMe so we can reach our goal of 50,000 dollars to Chenwei Guo Family Fund so the family could continue Chenwei’s service and mission! Update: We express gratitude to the 12 volunteers that translated all your posts on GoFundMe and Facebook pages into Chinese for Chenwei's parents to read. Your love and support will bring peace and comfort to their hearts. “Trusting in the Lord, let us turn our heads from such falsehoods and make certain our feet are firmly planted in the path of service and our hearts and souls dedicated to follow the example of the Lord. In moments when the light of resolution dims and when the heart grows faint, we can take comfort from His promise: ‘Be not weary in well-doing. … Out of small things proceedeth that which is great’” (Doctrine and Covenants 64:33). I love you all! You've touched many hearts. Thank you for your support for Chenwei Guo Family Fund.